Florida State likely was eliminated from the College Football Playoff race when it lost to North Carolina 37-35 on Saturday in Tallahassee. The Seminoles surely thought they had it. When Ricky Aguayo converted an extra point with 23 seconds left to put No. 12 Florida State up 35–34, a day that seemed destined for despair for the Seminoles suddenly appeared to be coming around at just the right time. North Carolina had taken the lead 7:03 into the game and Florida State never got ahead until Deondre Francois escaped from two dead-to-rights sacks to scramble in for a two-yard score, setting up Aguayo to put the Seminoles ahead with the extra point. Twenty-three seconds was too much time. North Carolina quarterback Mitch Trubisky led the Tar Heels down the field, completing a 23-yard pass to Mack Hollins before Florida State was penalized for defensive pass interference with four seconds left. Out came Nick Weiler, who had never made a field goal from longer than 49 yards, to try a 54-yarder. His boot sailed just the right distance, barely clearing the crossbar in the right corner to give North Carolina a 37–35 win. The Seminoles’ secondary struggled mightily in the first half of their season-opening win over Ole Miss with Rebels quarterback Chad Kelly despite a healthy James. But a quick glance at their performance over the last three games without the star safety reveals just how badly they need him. Louisville quarterback Lamar Jackson gashed Florida State for 216 yards on 13-of-20 passing. South Florida’s Quinton Flowers was unable to maintain success for the entire game but opened the contest with an 84-yard touchdown pass on the first play from scrimmage. Then came Saturday, when Trubisky simply dissected Florida State’s pass defense at will. The junior completed 31 of 38 passes for 405 yards with three touchdowns and no interceptions. He picked on senior defensive back Nate Andrews and took advantage of true freshman Kyle Meyers. Wide receiver Ryan Switzer utilized his agility for his third straight game with over 100 receiving yards, catching 14 passes for 158 yards. Florida State has now lost two of the three games it has played without James and given up an average of 45 points in that stretch. The Seminoles have surrendered 10.85 yards per pass attempt without James, more than any team in the country has averaged over the course of this season. It’s true that Florida State has faced some highly talented quarterbacks, so it’s not entirely surprising its passing defense would suffer. Jackson is the Heisman Trophy frontrunner, Flowers is one of the best quarterbacks in the Group of Five and Trubisky has emerged as one the ACC’s top passers in his first season as the starter. Still, the numbers the Seminoles are allowing are alarming for a team that entered the season with College Football Playoff aspirations. They leave the offense with too little margin for error. The scary prospect for Florida State is despite the accomplished passers who are in their rear-view mirror, things don’t get much easier. Miami’s Brad Kaaya awaits next week and Deshaun Watson and Clemson come to Tallahassee on Oct. 29. That sound you just heard is a big gulp coming from the defensive backs room. Remember what I said about the pass defense leaving the offense with little margin for error? That means the offense needs to capitalize on every opportunity and take advantage of every skillset at its disposal. Florida State didn’t do that Saturday. Despite Francois’s near-game-winning rushing touchdown, the redshirt freshman finished with just 32 yards on the ground. Granted Dalvin Cook did plenty of damage on his own with 140 yards and three scores, so it’s not as though the Noles were lacking for a ground game. But Francois was considered one of the top dual-threat quarterbacks coming out of high school, and Florida State is not using him like one. That allows defenses to ignore the running threat he presents, which renders ineffective ineffective read-options and other plays built around forcing the defense to choose between the quarterback and the running back. Five games into Francois’s career, he has a total of 97 rushing yards, nearly all of which came last week against South Florida when he tallied 75. Florida State’s offense can’t reach its full potential until Francois is fully utilized as both a passer and a runner. Fisher also needs to trust Francois to lead a drive by himself in more than just desperate circumstances. The Seminoles caught a big break late in the second quarter when North Carolina running back Elijah Hood fumbled at the Florida State two-yard line with 1:07 left before halftime. Trailing 21–7, Florida State could have gone into the half with a huge boost of momentum had the Seminoles struck for point in that last minute drive. Instead, Cook rushed three times, Francois attempted one pass, and Fisher seemed content to go into the half down 14. Francois proved himself more than capable of guiding Florida State down the field with little time left when he led the Noles to the go-ahead score with 23 seconds left in the game. He was hardly perfect Saturday—although he still finished 20 of 32 for 372 yards—but he deserves more opportunities to be a leader. Florida State needs him to be one. The Seminoles entered the 2016 season with dreams of returning to the playoff after reaching the semifinals in 2014. A Week 1 win over Ole Miss seemed to validate those aspirations. Their 63–20 drubbing at the hands of Louisville marked a clear diversion in their playoff path, but it still seemed quite possible. Florida State just had to win out, a difficult task but certainly not impossible for a team that got most of its remaining tests at home. 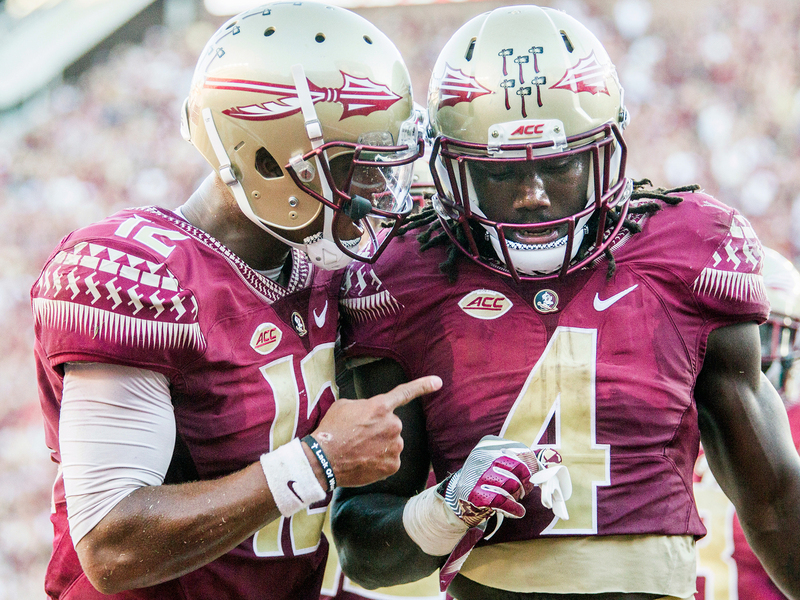 Instead, just five weeks into the season, the Seminoles are all but certain to finish outside of the top four. Even winning at Miami next week and over Clemson in four weeks won’t be enough to erase Florida State’s pair of losses. With two conference defeats, the Seminoles will now need Louisville—which will benefit from a favorable schedule after Saturday night’s trip to Death Valley—to lose three times to win the Atlantic Division and make the ACC championship game. Clemson could intervene in that situation, too. The ACC is still in a strong position to send a team to the playoff, but the road to the semifinals does not run through Tallahassee.